Business owners have been experimenting with chats on Facebook since the platform unveiled a “reply directly to comments” feature earlier this year. Facebook is rumored to be testing a group chat element as well as a formal chat room; in the meantime, business owners have been organizing them right on their page timelines, using the reply feature as the vehicle to drive the chat conversations. How does one organize a Facebook business chat? 1. Pick a compelling topic. It can be a trending issue; how to accomplish an objective; advice on completing a given task; a crowd sourcing exercise; a troubleshooting session. We might even crowd source for a topic! Whatever we choose should be something about which many people would be motivated to chat. 2. Keep in mind our specific goal(s) while choosing our topic. Do we wish to promote a new campaign? Increase engagement on our pages? Grow our reach? Add their contact information to our mailing lists? Our chat sessions should be guided in a manner that leads to or incorporates our goal(s). That may well mean designing a special landing page to which our participants can be directed. 3. If our chosen topic will require an expert’s participation, line up that person to be sure he/she is available for the chat. 4. Give LOTS of advance notice, and share it widely. Spread the word across Facebook personal profiles and business pages; other social media platforms on which we maintain presences; and even email messages. The earlier we advertise our upcoming chats and the farther we spread the word, the greater the turnout we are likely to see. 5. 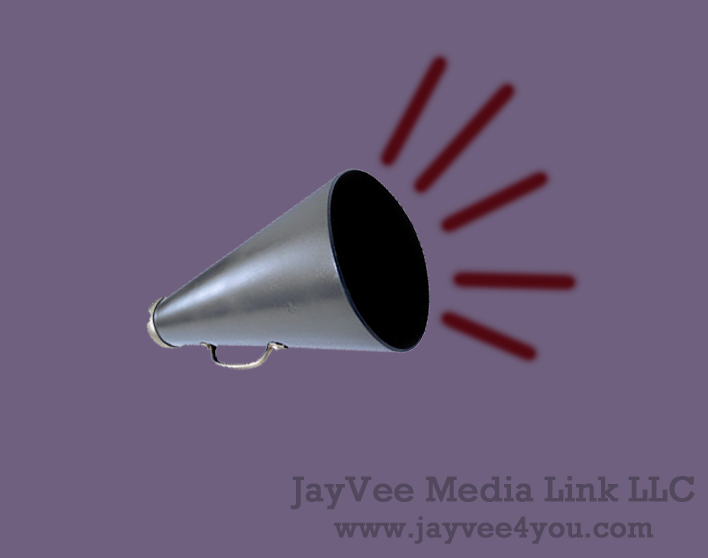 Create large, eye-catching graphics to use in advance notice postings. 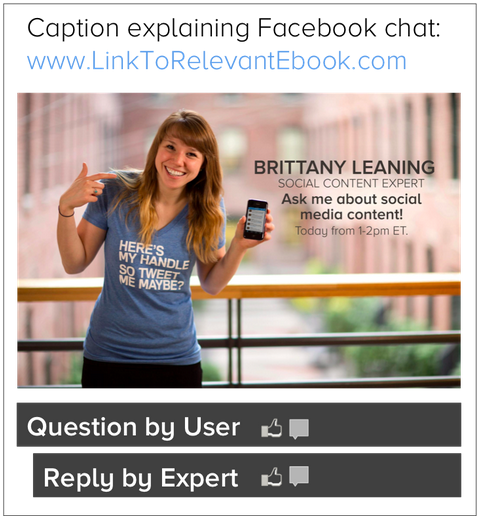 Be sure to incorporate the chat’s specifics in text right on the picture, including topic; hosting page and its URL; day, date and time; and featured expert guests, if any. Check out this example of an advance notice announcement HubSpot shared for one of its Facebook chats! 6. If possible, enlist another person to help watch the comment stream for both our guest experts and ourselves. Anyone who uses Facebook’s comment reply function understands that tracking those replies as well as new comments can become confusing. Some may be accidentally overlooked if we fail to scour the whole thread constantly. Also, monitoring the streams helps us to keep track of questions/comments we may not have time to answer. We may wish to follow up on those afterward with links to additional resources. 7. End with a specific call to action. Perhaps we would like our participants to download a discount coupon. Or we may wish to send them to a specific blog post for more information. Maybe we have invited them to download an ebook. Whatever our intentions, we need to wrap up our chats by directing participants to take a specific action. Remember the special landing page we discussed in step #2? This is where it will be put to use. 8. Share our chats after they conclude so others who couldn’t participate may benefit from the information that was disseminated. The more important and relevant the value received, the more likely those folks will make the time to attend our future chat events! 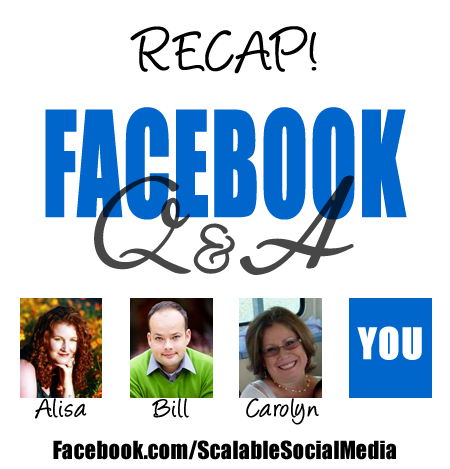 Here is a great example of a graphic announcing a Facebook chat recap for sharing, and here is the link to the actual post! Have you hosted a Facebook chat? If not, are you considering doing so? Please share your thoughts/experiences in the comments section below! This entry was posted in business online, chat, Facebook, Social Media Management/Marketing and tagged business online, chat, Facebook, Jeanine, Social Media Management/Marketing, Vecchiarelli by Jeanine Vecchiarelli. Bookmark the permalink. Thank YOU so much for sharing your experience, Alisa! I was very impressed by the way you ran your FB chat, as well as by the recap you shared. The way you conducted the chat served as inspiration for my post. Hence, I was happy to give you all a shout out!